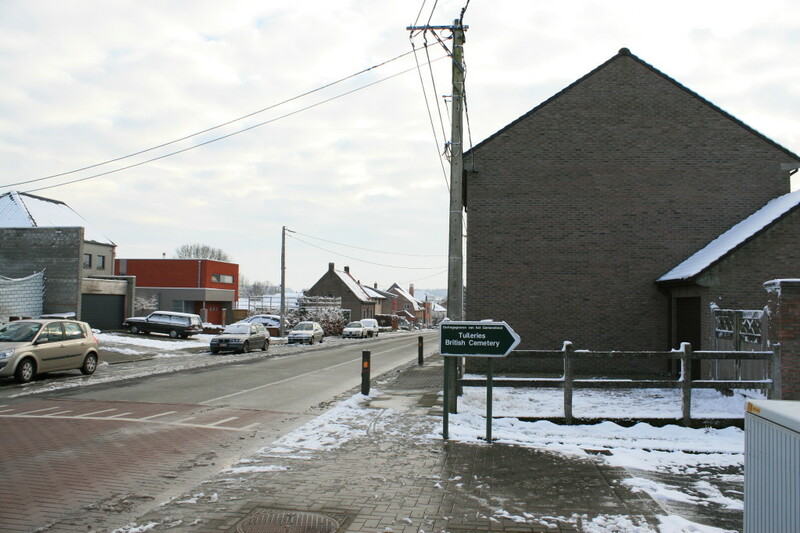 No more than a couple of hundred yards south of Perth Cemetery (China Wall), in the outskirts of Zillebeke, another British cemetery can be found behind these houses to the west of the road. …where we find, at the end, the cemetery entrance. It is immediately obvious that this is an unusual cemetery, with the majority of headstones lining the four boundary walls. It was only used between February and May 1915, and subsequently the area was so heavily shelled that, of the 95 men buried here, only 26 grave sites, the four rows in the centre of the picture above, are known for certain. 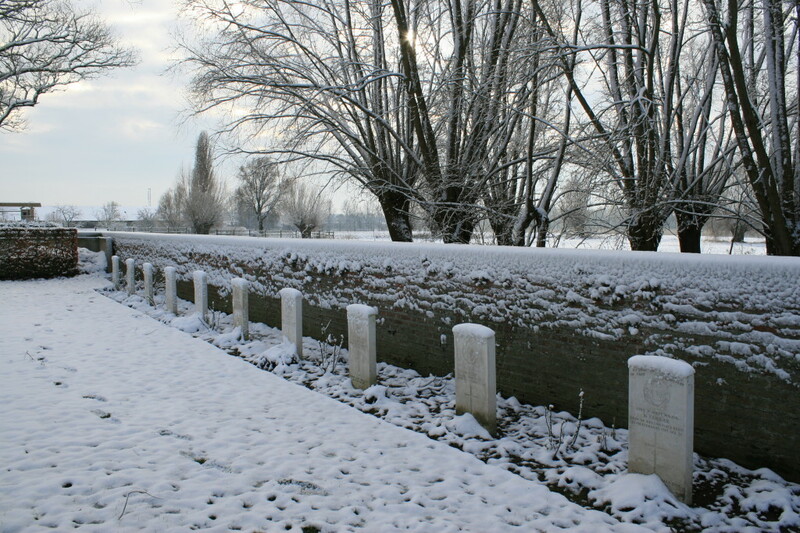 The other 69 men are remembered by the special memorial headstones positioned along the walls. 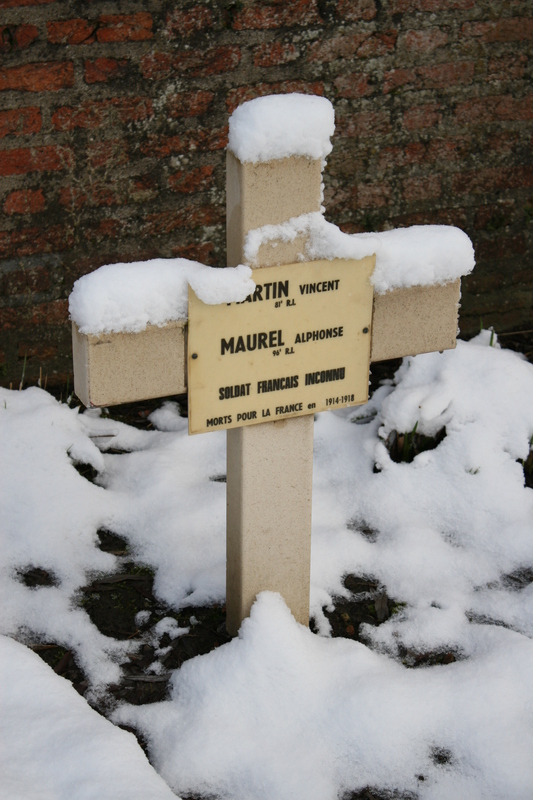 A single cross, to the left of the cemetery entrance (visible to the far left of the previous photo), remembers three Frenchmen, one unidentified, who were also once buried here but whose remains have been lost. Uh oh. Small child warning. The three headstones nearest the camera make up Special Memorials Row A, those beyond Row B. 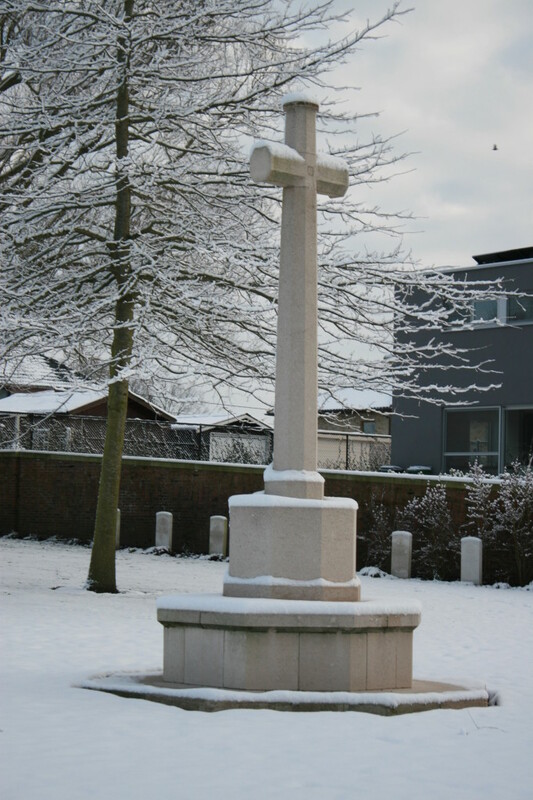 They remember men of the Queen’s Own (Royal West Kent Regiment), all bar one killed in February 1915. I should watch out if I were you, Balders. Sneak attack coming. 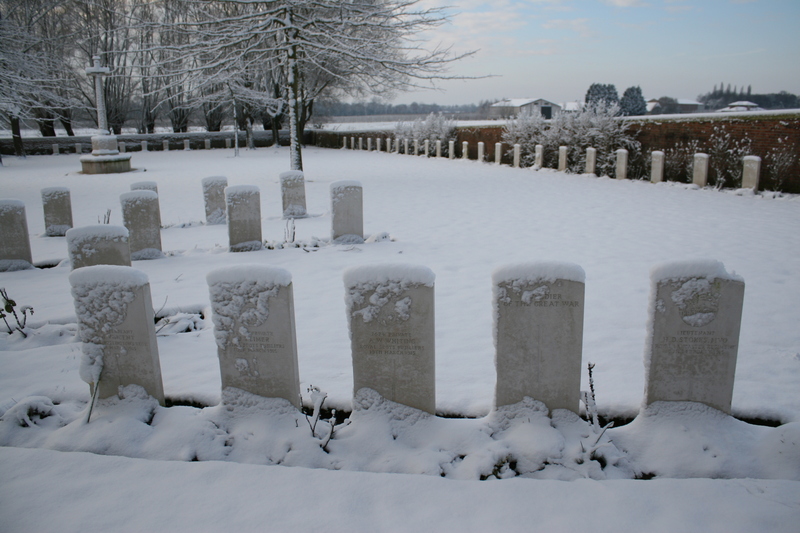 Of the 26 graves in Rows A to D, only ten are identified. 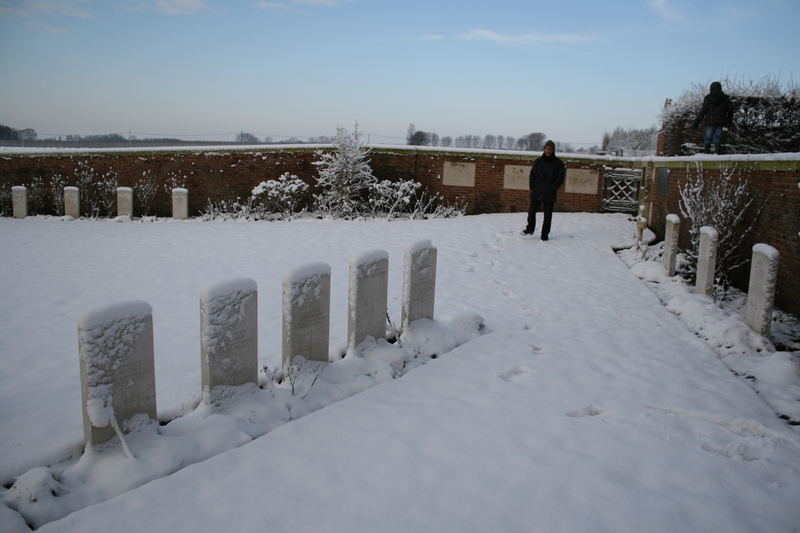 Above & below: The four rows of known graves, Row A nearest the camera. The cemetery was begun in 1915 in the grounds of a local tile factory (the literal translation of tuileries is tile-works), and it seems that during 1915 German artillery would use the chimneys of the factory to find their range, which explains why the sites of so many of the graves here were lost. 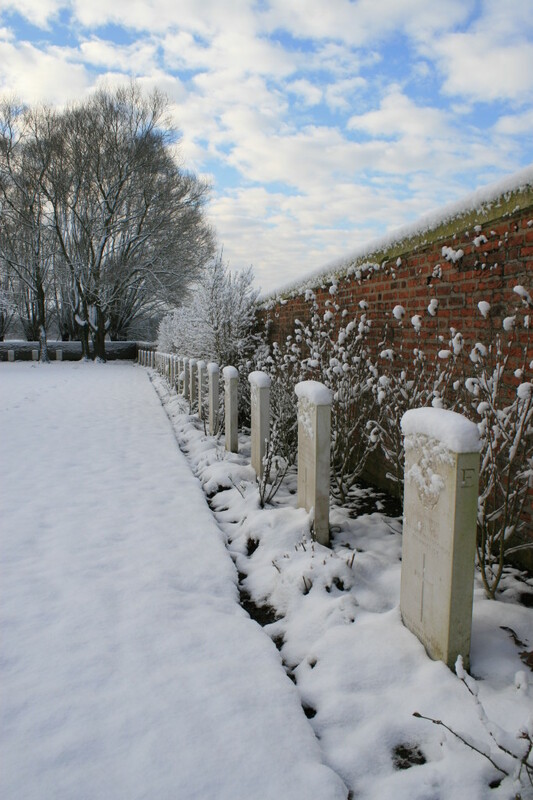 Special Memorials Row C comprises 24 headstones which line the southern boundary wall, eleven more men of the Queen’s Own alongside thirteen from the Duke of Wellington’s (West Riding Regiment). 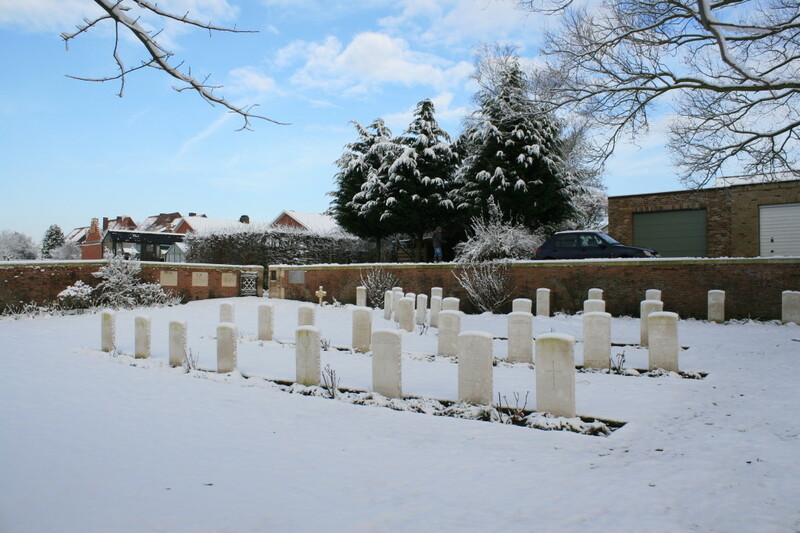 All the special memorial headstones bear the inscription ‘known to be buried in this cemetery’ above the regimental badge, and all have Kipling’s ‘their glory shall not be blotted out’ inscribed near the base, as you can see on the headstone remembering Private Skerritt in the foreground of the photo above. 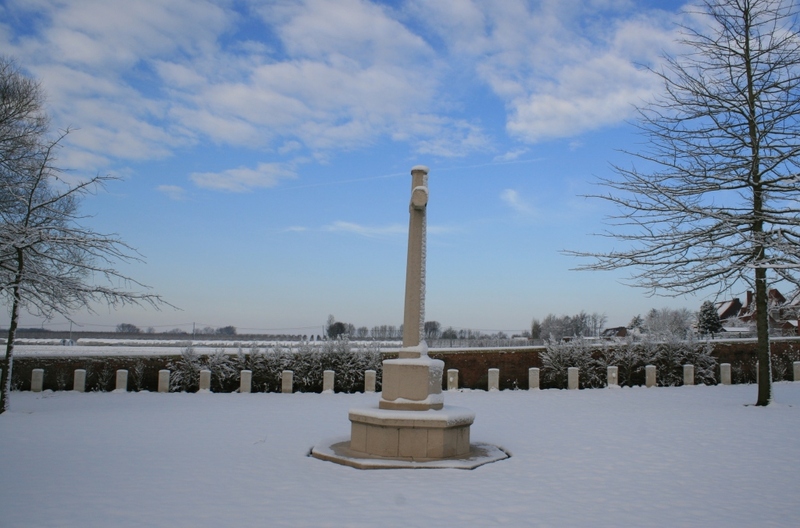 Looking north, the Cross of Sacrifice standing in isolation in the centre of the cemetery. …Special Memorials Row D (above & below). 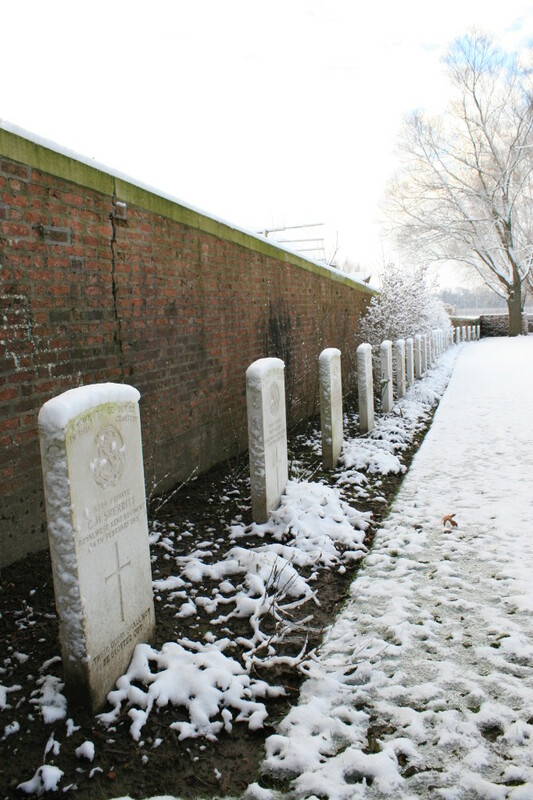 Unlike the other rows of special memorials, seven different regiments are represented among these headstones. 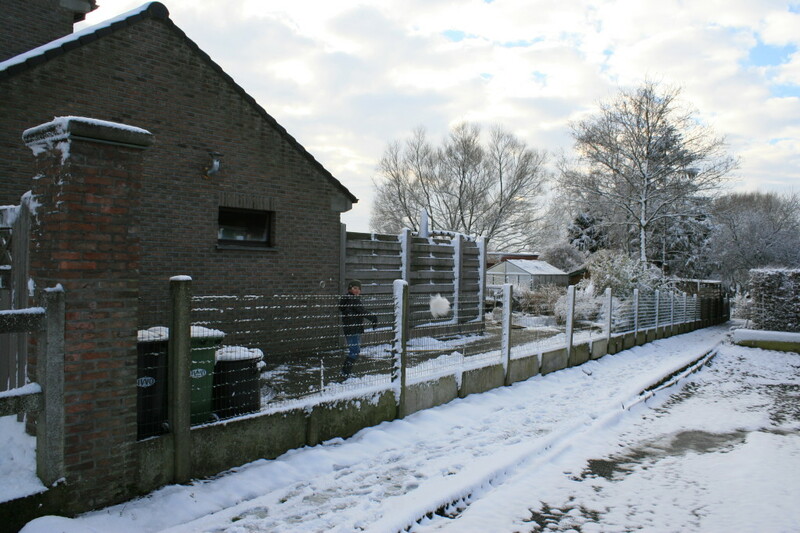 Winter in Flanders. 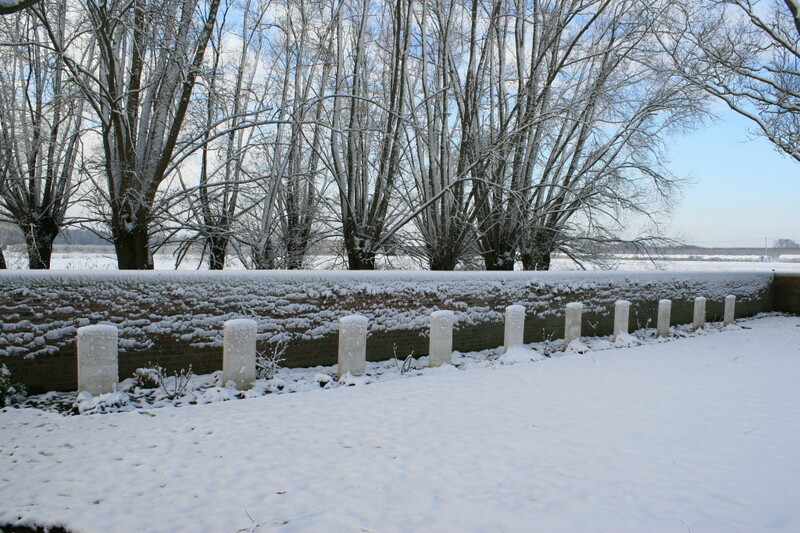 The trees on the horizon line the banks of Zillebeke Lake. 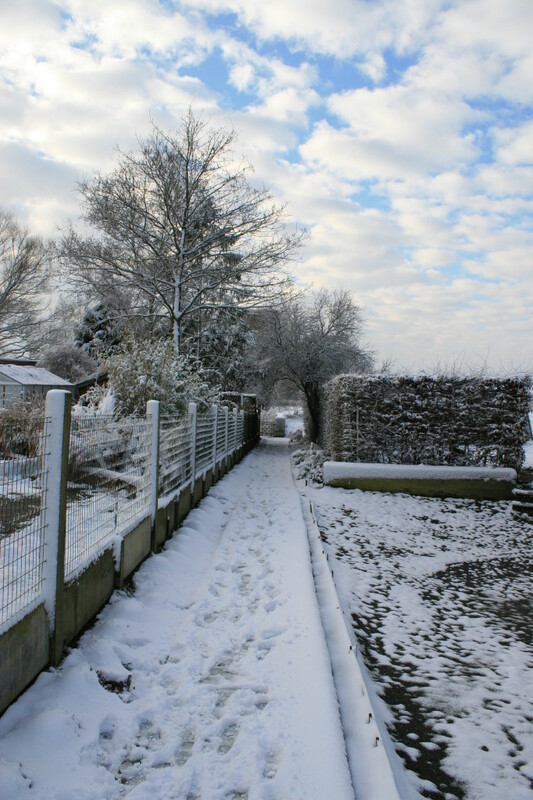 Looking east down the length of the cemetery from the western boundary. 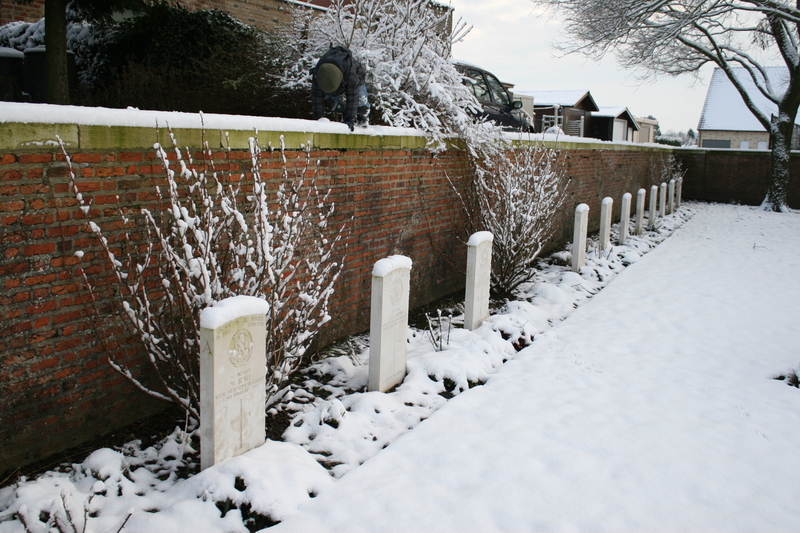 Along the northern boundary wall the headstones of Special Memorials Row E remember mainly men from the Cheshire Regiment. Special Memorials Row E, this time looking west. 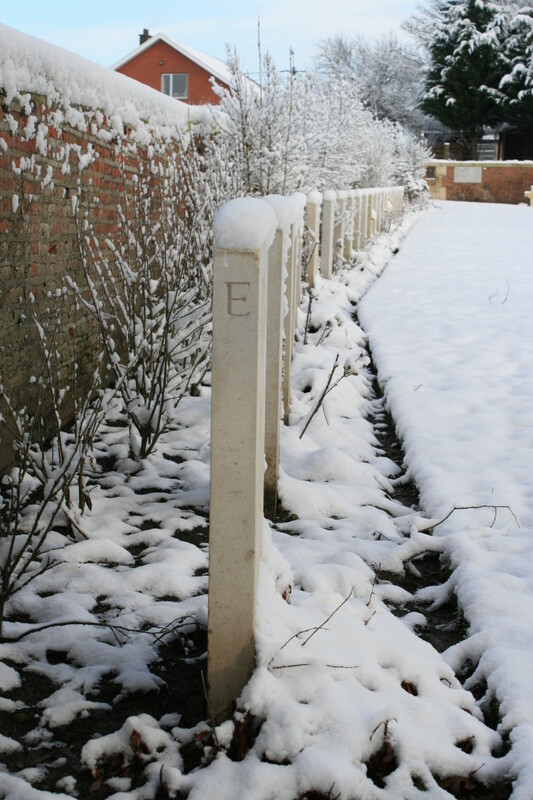 The names of four Queen’s Own men remembered in this row are inscribed on the four headstones nearest the camera. The remainder are all Cheshire men. 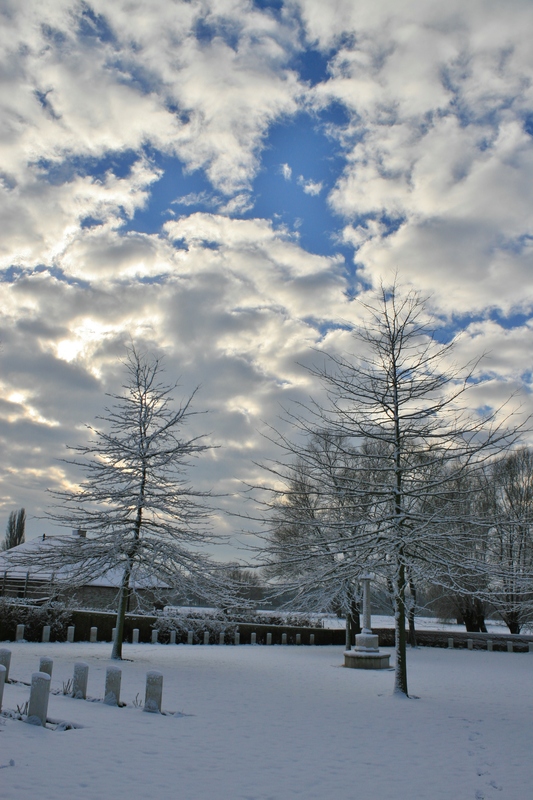 A big winter sky over a peaceful Flanders cemetery. Final view before we leave. 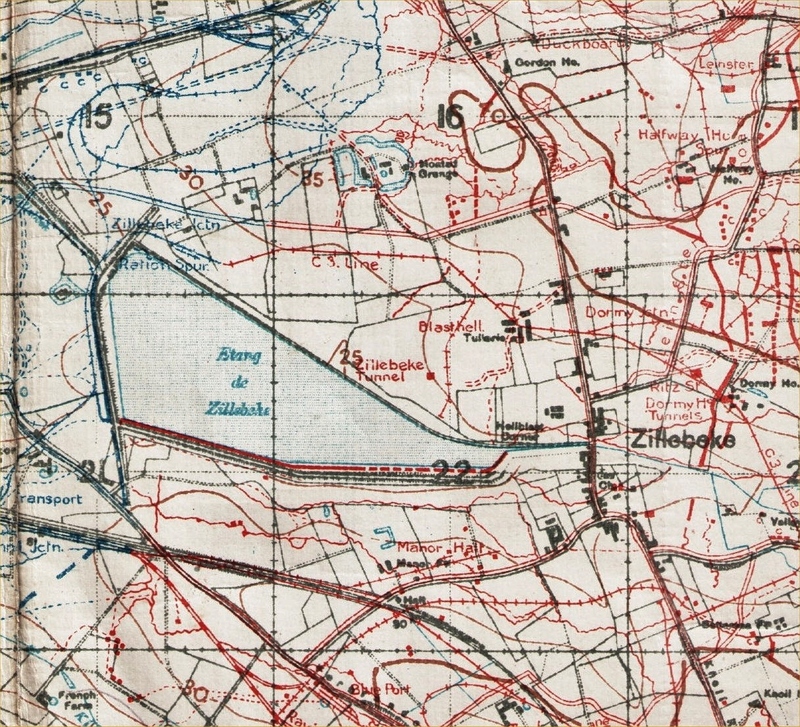 The German advance in the summer of 1918 was halted in these very fields, as you can see on the trench map below. This was as far west as they would get. The German positions are marked in red, and you can see the site of the cemetery (marked Tuillerie) near the centre of the map. You can also see the location of Halfway House Farm which, if you’ve read the Perth Cemetery (China Wall) post, might be of interest. A parting snowball sees us off the premises. 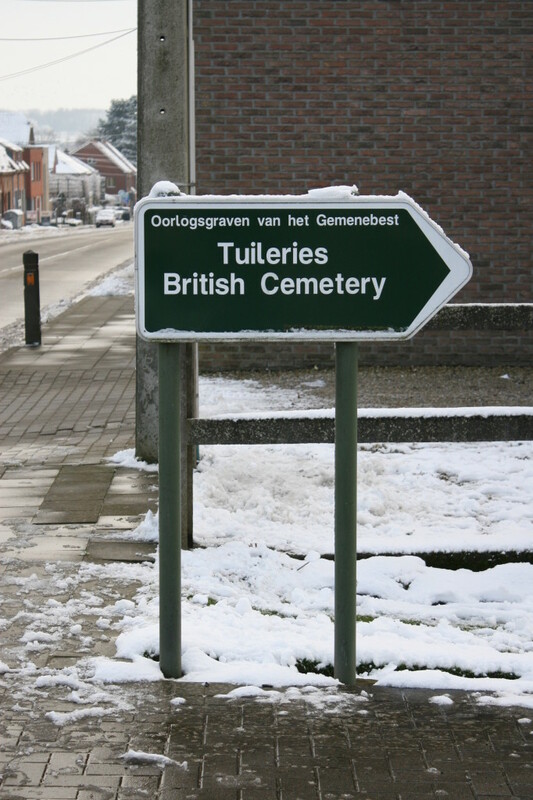 Just down the road, Zillebeke Churchyard contains 32 British burials. 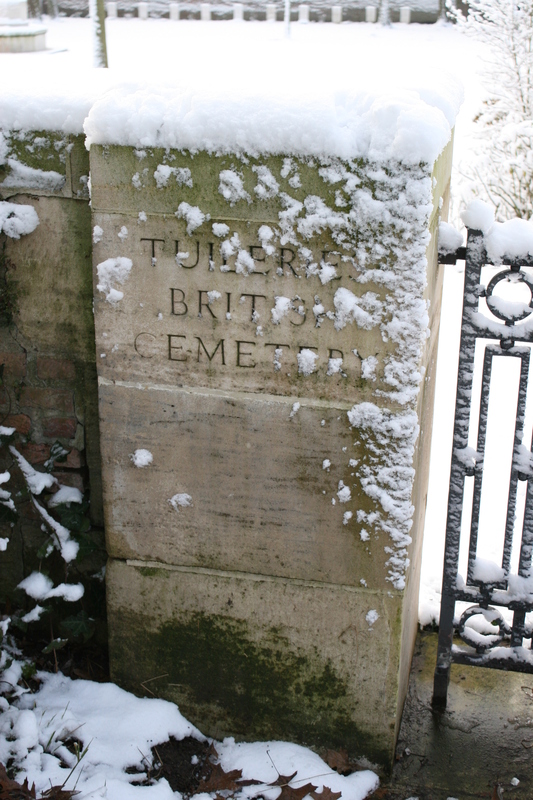 Known as the Aristocrats Cemetery, I suggest you click on the link if you wish to see it. 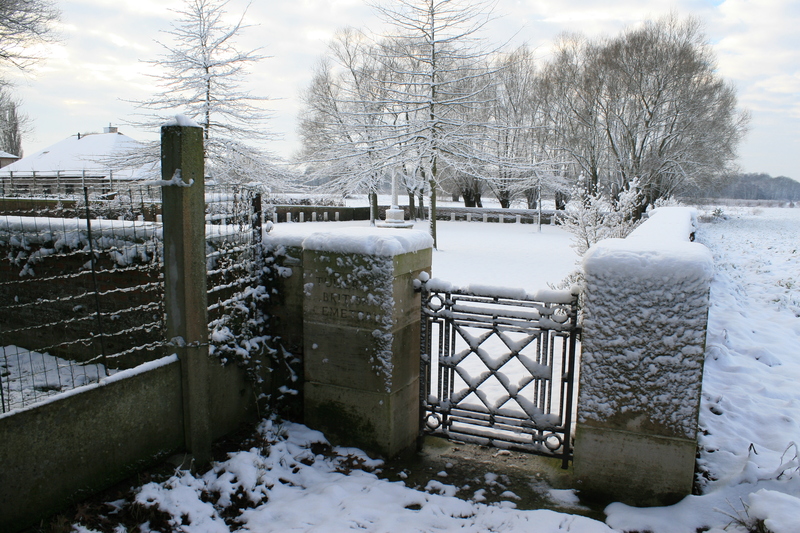 While making me shiver just looking at all that cold looking white stuff I think you call snow (ha ha) I can only imagine how exciting it must be for you to find such a hidden cemetery. The story you unfold is fascinating. Thank you so much for your wonderful posts. Ha! 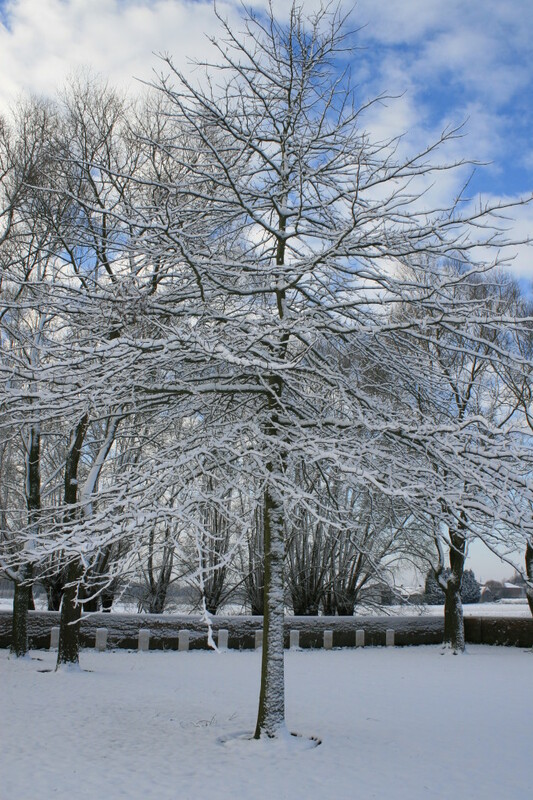 Cold, but very beautiful at times. Cheers Sid! 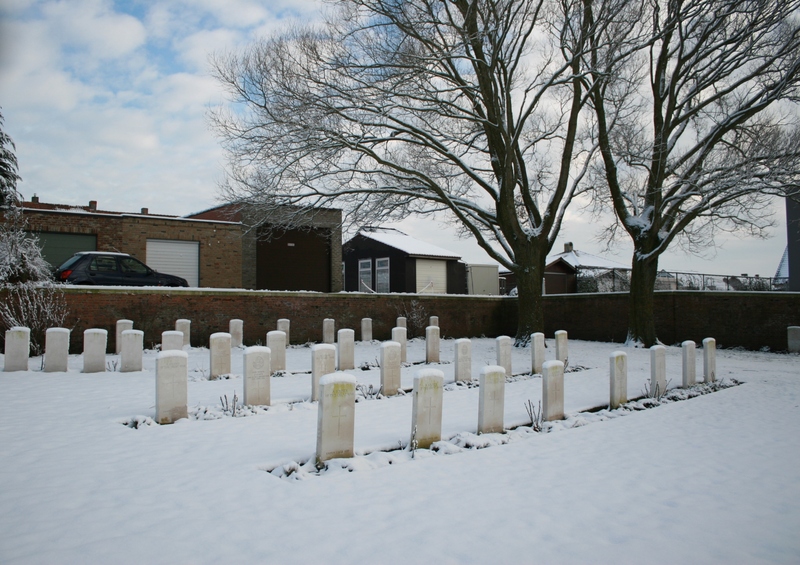 100 years ago this week, 17 March 1914, 2 companies of the 1Bn Lincolnshire Regt, C and D, were in support of their brigade, billeted in the Tile Works, including one Private Henry Atkinson, my uncle. Not the safest place to be billeted, I would have thought. What happened to him?